Will you be trying to complete the House Rules events in order to grab this Gronkowski? Hey ea. Jordy nelson just retired. 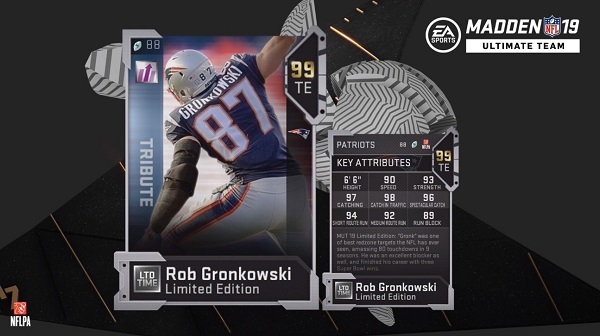 You have the same amount of time on gronk to get him a tribute card. Otherwise we know what your full of. What about a Jason wittWi comeback card. Or Kyle Williams retirement. Waste 10 hours playing a lame co-op game mode with idiots against the CPU. Thanks EA. You guys are jerks. It’s NOT free..most people don’t put that amount of time into a 99 over card absolutely which is not worth the time or effort except the thirstiest. Watching The Show 19 videos is more enjoyable..there’s your sign. I still think Vernon Davis has the better card... Just 3" shorter. Nobody said EA should give free cards. I grind plenty. Maybe you should do some grinding instead of throwing cusswords at me in a child friendly zone. Interesting... so you had a 98 Saquon months ago... and I paid $$ for my 95 Le'veon Bell Journey player huh? You have hundreds of posts complaining about EA and the game on MUTHEAD but I make one complaint post and I'm the player that expects jacks^%t for doing jacks%^t? People can see I play and you don't which is probably why you want the free card. I usually pick D on duo squads so I get paired with someone like you who keeps throwing into triple coverage. I don't want a free card, I just wanted a way to earn it without spending 10+ hours paired with an idiot in a game mode I do not care for and do not play. Really love the H2H house rules this week. Let's me feel like the 2000 Ravens with my theme team. BEND DONT BREAK. Let's you test your team against the pass, against actual people, not CPU situationals. Really feels less tedious, and find myself spending less time learning the new rules, that will only be around for 3 days... Less chaos, more purpose! How can you complain about two 97's (MVP & Combine) plus a free UL & Gronk? EA has been bad in the past but at least they're giving you an opportunity to EARN better players. Some of ya'll got participation trophies your entire lives and it really shows. So, you're talking about the "House Rules"-participants?